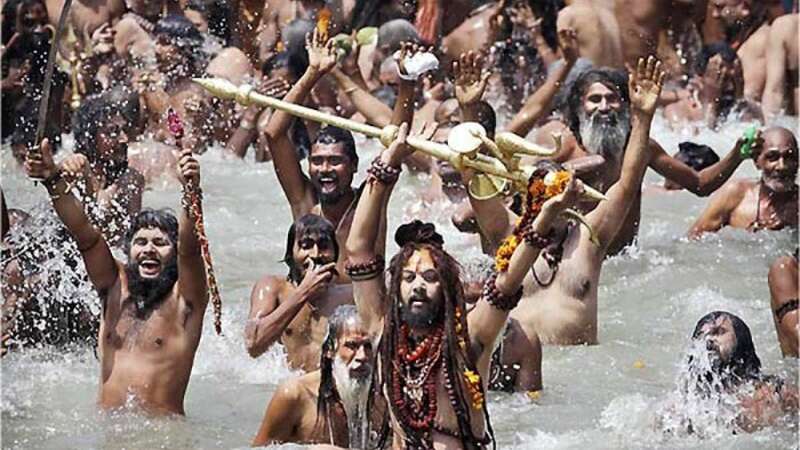 New Delhi : The Kumbh Mela 2019 has started with the slogan, 'Chalo Kumbh Chale'. Thousands of visitors arrived at Prayagraj in Uttar Pradesh to participate in the largest congregation in the world, and walked for miles to take a holy dip in the sangam. Close to 12 million pilgrims are taking the first 'Shahi Snan' at the confluence of Ganga, Yamuna and Saraswati, today. Sadhus of 13 Akharas took holy bath early morning on the day of Makar Sankranti, today. Devotees believe that a bath at Sangam during the seven week event will purify their body and soul and frees them from the immortal cycle of life and death. The sequence of holy bath in Prayagraj is pre-determined by various akharas. It starts with Mahanirvani along with the Atal akhara, the Niranjani along with the Ananada Akhara, and the Juna along with the Avahana and Agni akharas. They are followed by Nirvani akhara, Digambara akhara, Nirmohi akhara, Bada Udasin akhara, Naya Udasin akhara and lastly by the lone Sikh akhara called Nirmal akhara. "Almost 31 lakh people bathed at Sagar since morning, far surpassing the attendance last year. Lakhs took the holy dip on Friday evening as well. More pilgrims have come to Sagar this year as the weather is better. We are expecting the number to go up as the day progresses," Panchayat and Public Health Engineering Minister Subrata Mukherjee said. The world's largest religious gathering is maintained by tight security across the city. "We have started a checking campaign in view of the Kumbh Mela. Government Railway Police (GRP), Civil Police, Railway Protection Force (RPF) among others conducted the checking," Arvind Kumar, Station Officer- Government Railway Police, earlier said. According to UP government, over 150 million people are expected to be a part of the 'Divya Kumbh, Bhavya Kumbh' which spreads over 3,200 hectares and culminates on Mahashivratri day, i.e March 4. So, if you are planning to join Kumbh Mela 2019, then plan a trip now and gather memories of lifetime.